A sizable percentage of foreigners decide to stay and retire in Thailand because they meet the girl (or boy) of their dreams here. The number of seemingly available and very attractive Thai ladies in this country is sometimes overwhelming, and I’m sure the cause of many motorcycle accidents. If you want to marry a Thai citizen, you will need proof from your embassy that you are legally able to marry. 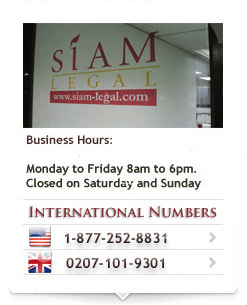 The legal marriage registration can be performed at any district office (amphur) in Thailand. First, you must visit your embassy in Thailand. If you have previously been married, you must provide the original divorce decree or death certificate. If you have not been married, your embassy will verify that. Request an affidavit (U.S.) or affirmation of freedom to marry (U.K.), which must be completed and notarized at the embassy. The embassy will usually charge about 4,000 baht for this service. This affidavit or affirmation must be translated into Thai by a licensed legal translator, of which there are many close to the embassies. Translation fee is typically about 5,000 baht. The translated affidavit or affirmation must then be stamped by the Legalization and Naturalization Division, Department of Consular Affairs, Ministry of Foreign Affairs(www.mfa.go.th) at 123 Chaeng Wattana Road, Laksi District, Bangkok 11120. (Tel. 02 575-1056 -59, 02 981-7171.) There are two fees available: 400 baht per document, taking up to two full days; or 800 baht per document for the same-day service. The translation service may be able to take care of this for you for a small fee and mail it to you if you are not resident in Bangkok. Then, at any future date, you can go to get married at any amphur. You will need to bring the translated, stamped affidavit or affirmation; passport; and ID card of your future spouse. You do not need witnesses as in the U.S. or U.K., and marriage at the amphur is free. Once you are married, everything you or your spouse ac¬quires (except land [see later chapter]) is joint property of the marriage. Everything you owned before the marriage remains 100% yours. This is significant in the case of divorce. You may want to seek professional legal advice about prenuptial agreements and wills prior to marriage. It is normal in Thailand for the man to give a dowry to the family of the bride. This would normally be 20,000 to 100,000 baht for a village girl with little education and no career, up to 2,000,000 baht or more for a college-educated girl from a middle- or upper-class family. Many Western men are tempted, or lured, into settling close to their wife’s hometown or village. Be aware that this can be problematic, as the extended family—which typically includes at least half the village—will view a foreigner as a walking ATM machine. Your wife will receive daily visits from family and friends in need, asking for “loans,” which, even if refused, can become a strain on the marriage and quality of life.